The Foreign Office (FCO) has launched disciplinary action against a member of staff after a somewhat surprising headline appeared on its website today. The announcement that the FCO has pledged an additional £2.2 million in funding to the World Service was titled: “Massive U-turn on BBC World Service funding”. Obviously not the kind of language government departments normally clothe their massive U-turns in. 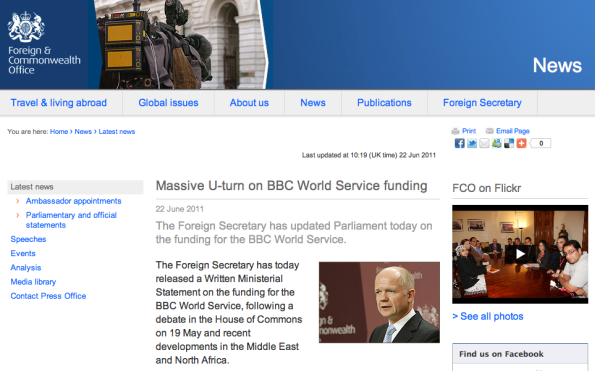 Full Journalism.co.uk story on the World Service funding announcement at this link. Image courtesy of Tim Montgomerie at Conservative Home. This entry was posted in Funny, Job losses and tagged foreign office, gaffe, william hague, World Service on June 22, 2011 by Joel Gunter. Following the William Hague allegations sparked from posts within the blogging community last week, this weekend the media spotlight turned to Wayne Rooney as allegations relating to his private life were brought into the public domain by the News of the World and the Sunday Mirror, both appers accusing the footballer of having an affair with a prostitute. In response, the International Forum for Responsible Media blog has posted an interesting analysis of the issues raised by the press coverage. These mainly centre on the distinction between a story which is argued to be ‘in’ the public interest and one which is simply ‘of’ public interest – the latter of which would not theoretically afford the same justification for publication. What takes place between Mr Rooney and Ms Thompson behind the closed doors of a hotel bedroom is, at first sight, private. It relates to an indisputable area of private life: sexual relations. Under the general law and the clause 3 of the PCC Code, its publication requires justification in terms of the public interest. Looking at the newspapers’ references to a public interest in their own reports, the blog argues that in this case the coverage fails to provide such justification. The central justification appears to be the familiar one that this conduct exposes the hypocrisy of Mr Rooney’s “crafting” of “a brand of happy family life that’s helped win big-money sponsorships and endorsements”. There are a number of difficulties with this argument (…) What false public pronouncements are actually being shown to be false? A “brand of happy family life” – even if “carefully crafted” – is not, in itself, a public statement about conduct or morality. (…) This kind of assertion is a patently inadequate basis to justify splashing someone’s private life across the pages of the national press. Another issue raised by the blog post is that of the right of individuals to an advance warning. The author refers with some concern to a statement in the Mail on Sunday’s report on the allegations which claims Rooney’s lawyers were aware but decided not to battle the allegation due to previous “revelations” in the media. We do not know whether this is correct. If it is it is an unfortunate reflection on the state of English privacy law – where it is thought to be impossible to restrain the publication of patently private information because of previous press publicity. If, on the other hand, Mr Rooney was not given proper notice then this would be further support for the arguments being advanced by Max Mosley in Strasbourg in favour of a legal obligation to give advance notice. This entry was posted in Editors' pick, Legal, Newspapers, Politics, Press freedom and ethics and tagged inforrm blog, Max Mosely, privacy, private life, Wayne Rooney, william hague on September 6, 2010 by Rachel Bartlett. The approach of some sections of the media to this story was not only irresponsible but is also, in seems to us, positively damaging to the public interest. If talented and accomplished politicians like Mr Hague are subject to rumour and innuendo of this kind they could be forgiven for thinking that a career in public life is not worth it. Of course the media should be scrutinising the decisions of elected politicians – including their decisions about the employment of advisers. What they should not be doing is sniping at their private lifes [sic] – forcing them to reveal matters which are deeply private and personal. The lack of public interest or benefit is plain. This entry was posted in Editors' pick, Press freedom and ethics and tagged christopher myers, inforrm blog, public interest, william hague on September 2, 2010 by Laura Oliver.